Part of living a green lifestyle is reducing the amount of waste you and your family produce on a daily basis. While monitoring your waste and recycling habits at home may be second nature, you may not have considered that your child’s school lunches could be producing as much as 67 pounds of trash every school year. Fortunately, there are some ways you can manage excessive trash by packing -a waste free lunch. In fact, according to the U.S. Environmental Protection Agency, packing a waste free lunch for your child can save you as much as $250 every school year. Re-usable containers are one of the most efficient ways of reducing waste in your child’s school lunch. Many parents pack lunches in paper bags, re-sealable plastic bags and other disposable containers. By switching to a reusable cooler or lunch box, you not only reduce the amount of trash your child throws away each day, but you can also lower your grocery bill each month. If possible, give your children reusable cloth napkins and utensils, as well as a thermos or reusable water bottle instead of the pre-packaged disposable varieties. Many parents pack too much food in school lunches — a large percentage of which is thrown away uneaten. According to Reduce.org, Americans throw away approximately 48 million tons of food every year, which represents approximately 20 percent of our total food purchases. Try packing a healthy, well-balanced lunch that includes a single serving each of vegetables and fruit, as well as some protein and whole grains. 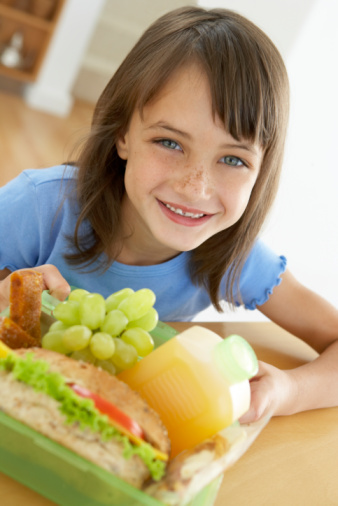 Keep in mind, the average school-aged child only needs 1,600 to 2,500 calories total per day according to KidsHealth.org. It is never too soon to start teaching your children about minimizing waste. Start by teaching your kids which items to place in the school recycling bin, rather than the trash. Furthermore, on days when your child purchases lunch at school, teach him or her to only accept the items needed for each meal, such as a single napkin and ketchup packet. You could also teach your child to avoid using straws to help reduce school lunchroom waste.